The famous American wilderness explorer, John Muir, once said, “To the lover of wilderness, Alaska is one of the most wonderful countries in the world.” And it is indeed amazing… especially when you have the privilege, as I did at Pond Island, to just float quietly on still waters taking in the beauty that surrounds you. Let me share it with you. Much of the time, as we moved slowly along the shoreline, we just enjoyed the peace and the beauty of the wilderness that surrounded us, especially the reflections in still waters. That peace was only broken when we saw wildlife along the way. Then Jason would quietly tell us something about each one as we observed their behaviour in the wild. This was the first day on this expedition that the kayaks were in use. The conditions were perfect for that activity. Some of our group, like David, had chosen to walk, some to kayak and some, like me, to explore by DIB. We all enjoyed the beauty of this wilderness area in our own way. At one end of the bay was a rocky island, a perfect example of a conifer forest surrounded by the deeper green of the much smaller Sitka alders. The island provided a great look out point for a pair of bald eagles. It’s hard to tell which is male and which female, they look so similar. The female is, in fact, slightly larger. Bald eagles are the national bird of USA, indeed it’s the only bird unique to North America. Its scientific name is Haliaeetus leucocephalus; from Greek hali “sea”, aiētos “eagle”, leuco “white” and cephalos “head”. About half of the world’s 70,000 bald eagles live in Alaska so it’s not a surprise to see them here. In this bay, the eagles were on the look out for salmon as the annual salmon run was just beginning. They will eat both dead and dying fish. It was good to watch the eagles in the wild away from human habitation. Further south in the ‘Lower 48’ states, bald eagles and other birds of prey such as kites and hawks, are vulnerable to toxic chemicals in the environment. Because these birds are at the top of the food chain, each link in that food chain tends to concentrate chemicals from the lower link. Here, in the wilds of South East Alaska, they are free from that danger. We gradually made our way towards a small creek where salmon were beginning to congregate for the start of their annual spawning run. Five types of salmon occur in Alaska, easily remembered by looking at your fingers! Thumb = Chum; Pointer = Sockeye ( a bit obscure but it helps to have a bit of imagination! ); Middle finger = King; Ring finger = Silver; and Pinky finger = Pink. In general, adult salmon eat other fish, squid, eels, and shrimp. However Sockeye salmon has a diet that consists almost entirely of plankton. just grasses and the delightful red paintbrush, Castilleja miniata. If we had been able to have a closer look at the red paintbrush plant, as David did while walking on the shore, we would have seen that the red parts are actually modified leaves, or bracts. The flower is tiny, protected by the bracts. I loved the reflections of this island; another example of nature’s abstract art! As we turned the corner, we came into a small pool where the salmon collect before their final spawning run. Alaskan salmon are anadromous, meaning they are born in freshwater (rivers or streams) before they travel to and live much of their lives in salt water. They then return to freshwater to spawn. It has long been believed that salmon return to the exact spot where they were born in order to spawn. Recent tracking studies have shown this to be mostly true although some do stray and spawn in different freshwater systems. Such homing behaviour is quite an amazing phenomenon and has been shown to depend on olfactory memory. When the female reaches the place where she will lay her eggs, she makes a depression in the river or creek bed with her tail, and then deposits some of her eggs. She then waits for males to fertilise the eggs before covering the depression. She then moves on to make another depression. Females will make as many depressions as they need in order to lay all of their eggs; that may be up to seven depressions. After spawning, the adults die and thus provide more food for bears and eagles. Young salmon will stay for six months to three years in their natal stream. Only 10% of all salmon eggs are estimated to survive that period. As they prepare to leave the creeks for the ocean, their body chemistry changes, thus allowing them to live in saltwater. They will then spend about one to five years (depending on the species) in the open ocean. There they gradually become sexually mature and prepare to return to the creeks of their birth. It’s another of the wonderful stories of nature. As we sat quietly in this pool area, enjoying the reflections, we noticed movement. A female merganser was moving along beside the shore. She was very watchful of us, as we were of her! We stayed very still and she seemed to accept our presence. She was followed by her brood of ducklings. They are similar to their mother except for a short black-edged white stripe between the eye and bill. They were wonderfully camouflaged against the barnacles, rocks and sea weeds. We stayed our distance and watched them. These birds, Mergus Merganser, need nesting holes in the mature trees of these forests for breeding. The female lays usually 8 to 12 white to yellowish eggs and raises one brood each season. This one had five ducklings with her; maybe others had fallen prey to predators. As soon as the eggs hatch, the female takes the ducklings in her bill down to the pool or river. They feed on freshwater invertebrates and small fish fry. They are fully fledged when 60–70 days old but are not sexually mature until they are two years old. Back out in the main bay we saw a pair of Marbled murrelets, very small sea birds with a very long Latin name: Brachyramphus marmoratus. They’re difficult to photograph partly because of their size and partly because they are very busy little birds, constantly diving to feed on sand eels, herrings and other small fish. They feed in pairs and we saw them often as we sailed in the waters of the Inside Passage where they are never far from a forest. Old growth forests are especially important to Marbled murrelets. Unlike other sea birds, these little birds nest on the mossy branches of old trees, particularly the hemlock and the spruce so prevalent in these forests. This habit of nesting in trees, rather than on cliffs and rock ledges or in burrows like other sea birds, was not documented until 1974 when a tree climber found a nest. It was a rather remarkable finding and has had important implications for the logging of old growth forests in the area. 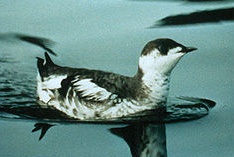 In many places on their habitat range, this species of murrelet has declined in numbers because of logging. Even without the pressure of the logging of their nesting trees, murrelets are hard pressed to succeed in the breeding process. After choosing a tree with lots of moss and lichen on the branches and with plenty of cover from predators, the female murrelet lays just one egg on a platform of lichen and moss. After a month of incubation, the chick hatches and is fed for about forty days until it’s able to fledge and fend for itself. Breeding success is low and chick mortality is high. We were entranced by these little birds each day of the expedition. Every now and then, a round grey head would pop up on the surface, have a quick look around and then slip quietly away again beneath the surface. This was a harbour seal. They don’t stay long on the surface and are hard to photograph in the wild because it’s not easy to predict when they will resurface. They stay down for quite a while as they seek fish, squid and shrimp. In 2010, an aerial survey of harbour seals in Southeast Alaska estimated that there were 60,000 harbour seals in these cold, fish rich waters. They are a delight to observe. These are tidal waters, so the DIB drivers put out buoys to mark rocky areas that would become shallower as the day went on. The forest reflections were lovely. Return of the kayakers © JT of jtdytravels; P113098. Happy kayakers gradually came back closer to shore. Their time afloat was almost over. It would take some time to collect the kayaks and take them back to the ship. Sadly, it was time for me to go back to the “Sea Lion”; the Dibs were needed for other tasks. Meanwhile, David was still on shore doing a beach walk while he waited his turn to return to the ship. So next time, we’ll wander along the shore here at Pond Island with him. If you are enjoying this armchair travel series, please pass the site onto others.